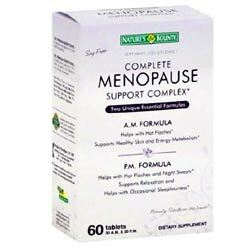 What is Nature’s Bounty Complete Menopause Support? The product is a combination of two formulas for menopause relief: one for the morning and another for night time. The supplement is called Nature’s Bounty Optimal Solutions Complete Menopause Support Complex which contains herbal extracts but it is also enriched with nutrients to relieve menopause concerns including hot flashes, mood swings, and sleep problems. 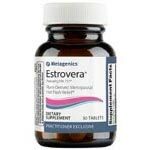 It comes in two formulations to ensure support throughout the day for menopausal women. The natural menopause supplement doesn’t contain artificial flavoring, lactose, soy, gluten, wheat, yeast or fish and is suitable for vegetarians. Nature’s Bounty Complete Menopause Support Ingredients – Are they Safe & Effective? The A.M. formula contains calcium, biotin, green tea extract, ginseng extract and black cohosh extract. Calcium is to help prevent bone density loss which is a common occurrence in menopausal women. Green tea extract is rich in antioxidants that strengthen the body and boost energy. Ginseng extract also keeps the user energized but it is also known to enhance mental performance and help prevent fatigue. Black cohosh extract is a popular herb used as a remedy for different menopause symptoms. The P.M. formula contains calcium, valerian extract, hops flower extract, L-theanine, black cohosh extract, and melatonin. Valerian is a popular natural relaxant that can be used to control stress and relieve anxiety. Hops extract is also used for stress management and offers relaxant properties as well. Melatonin is the sleep hormone that regulates the sleep-wake cycle. Melatonin levels naturally decrease during menopause so supplementing helps address sleep problems. How Does Nature’s Bounty Complete Menopause Support Work? Nature’s Bounty Optimal Solutions Complete Menopause Support Complex essentially works with the use of herbs that are used in alternative medicine. It contains black cohosh which is a popular remedy for hot flashes. The formulation also includes relaxing herbs that help address and prevent sleep problems which is one of the most problematic menopause symptoms. Calcium is added to the formula to prevent bone density loss and osteoporosis which commonly occurs in menopausal women. What are the Advantages of Nature’s Bounty Complete Menopause Support? What are the Disadvantages of Nature’s Bounty Complete Menopause Support? Take one A.M. formula tablet in the morning and a P.M. formula tablet in the evening. Take the morning formula with breakfast and the evening formula about 30 minutes before going to bed since it may cause drowsiness. What Kind of Results to Expect? According to people who have used Nature’s Bounty Optimal Solutions Complete Menopause Support Complex, the menopause product can help relieve hot flashes, night sweats and sleep problems. However, it is not very effective for other menopause symptoms like mood swings, vaginal dryness, etc. The formula typically works within 3 weeks. Take note that most users sat it doesn’t really offer significant menopause relief. Overall, Nature’s Bounty Optimal Solutions Complete Menopause Support Complex is just a regular menopause relief product. It only contains a few active ingredients which are actually not substantially proven to relieve menopause symptoms. Although there are some good reviews on the product, most say it only offers minimal results. There are better menopause supplements that are proven to be both effective and safe.